The New England Patriots had a 1-1 record and were coming off an exciting down-to-the-wire win over Atlanta the previous week as they faced a tougher test in hosting the Washington Redskins on October 1, 1972. The Patriots were a rebuilding team in their second year in Foxboro, MA under Head Coach John Mazur. 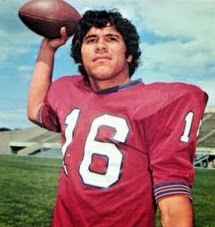 The key to that rebuilding project was QB Jim Plunkett (pictured at right), the first overall draft pick in ‘71 following a Heisman-winning college career at Stanford. New England was coming off a 6-8 record, the team’s best in five years, and looking to improve. Washington was in its second year under Head Coach George Allen and had reached the postseason for the first time in 26 seasons following a 9-4-1 tally in 1971. The veteran-laden club, known as “The Over-the-Hill Gang”, had a strong running game led by HB Larry Brown and QB Bill Kilmer throwing to wide receivers Charley Taylor and Roy Jefferson plus TE Jerry Smith. The rugged defense was even more of a key to the team’s success. The Redskins had won their first two games over the Vikings and Cardinals. It was an overcast and cool day with 60,999 in attendance at Schaefer Stadium. The first quarter was scoreless but the Redskins got on the board early in the second quarter as Bill Kilmer threw to Charley Taylor for a 30-yard touchdown that finished off an 80-yard drive in five plays. Things didn’t get any better for the Patriots when HB Jack Maitland fumbled while returning the ensuing kickoff and safety Richie Petitbon recovered for Washington at the New England 17. Five plays later, Kilmer again connected with Taylor (pictured below) for a four-yard touchdown and 14-0 lead. The Patriots responded with a long possession that covered 83 yards in 12 plays. Rookie FB Josh Ashton converted a third-and-two situation with an 11-yard run to his own 36 and, three plays later and facing third-and-ten, Plunkett completed a pass to WR Reggie Rucker for 40 yards to get the ball into Washington territory at the 24. New England went for it with fourth-and-one at the 15 and Ashton ran for three yards, and the fullback kept it going with a 10-yard gain around end followed by a two-yard carry for a touchdown. Charlie Gogolak added the extra point to cut the Washington lead to 14-7. The Redskins came right back as Larry Brown ran the ball three straight times for 22 yards and Kilmer again connected with Taylor for 19 yards to the New England 35. But after reaching the 28, Brown fumbled and LB Jim Cheyunski recovered for the Patriots to end the threat. New England’s offense wasn’t able to move appreciably and the half ended with the visitors maintaining a seven-point margin. The Patriots took the second half kickoff and drove 73 yards in eight plays. Plunkett threw to Rucker for a 22-yard gain and Ashton gained 27 yards on a sweep to the Washington 20. The series ended with Plunkett hitting Rucker for an 11-yard TD and, with Gogolak’s extra point, the game was tied at 14-14. The Redskins had to punt following their next possession and the Patriots reached the Washington 48 before HB Bob Gladieux’s option pass intended for WR Randy Vataha was picked off by CB Mike Bass, who returned it 29 yards. Runs by Brown and FB Charlie Harraway picked up 14 yards and two Kilmer passes picked up another 16 yards to the New England 23, but another throw was intercepted by CB Larry Carwell to again close off another opportunity for the visitors. With Ashton again running effectively, Plunkett added passes to Vataha for 20 yards and TE Bob Windsor for 10. The drive bogged down at the Washington 35 and Gogolak put the Patriots ahead with a 42-yard field goal. The Redskins started off the fourth quarter with a long drive of 70 yards in 10 plays that didn’t come up empty. Kilmer hit on short passes and Brown gained 36 yards on a draw play to the New England 20. The series ended with Kilmer completing a nine-yard pass to Jerry Smith for a touchdown and, with Curt Knight’s third successful PAT, Washington was back in front at 21-17. The Patriots responded by putting together an eight-play, 80-yard drive. Plunkett completed all four of his passes, including a 24-yard toss while scrambling away from a heavy rush to Ashton at the goal line for a TD. Gogolak’s extra point put New England up by three with fewer than four minutes to play. 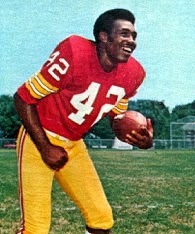 Following a 30-yard kickoff return by safety Speedy Duncan, the Redskins put themselves in a second-and-32 situation at their own 13 due to penalties, but from there Kilmer threw to Taylor for a 62-yard gain that not only got them out of a hole but put them at the New England 25 at the two-minute warning. Two passes were incomplete and then a throw into the end zone for Jefferson was caught but ruled out of bounds. Knight came in and kicked a 33-yard field goal but was run into by DB Ron Bolton. George Allen elected to take the points off the board and keep the drive going. A short run was followed by two incomplete passes and Knight came back in to attempt another field goal, this time from 27 yards. However, the gamble failed when the kick sailed wide to the right and was unsuccessful. With the clock ticking down to the final minute, the Patriots kept the ball on the ground. Ashton ran the ball three times and New England lined up to punt. However, Pat Studstill’s kick was blocked by WR Bill Malinchak and, with the Washington special team player unable to corral the ball, rolled out of the end zone for a safety. It was a one-point game and Washington was getting the ball back on the free kick with the remaining time down to 50 seconds. Duncan returned the free kick to the New England 48. The Redskins were able to pick up six yards before Knight came back on to attempt a 50-yard field goal. Again the kick went wide to the right and the Patriots came away with a 24-23 upset victory – and for the second week in a row, it came down to a missed try for a field goal by their opponent. New England outgained the Redskins (380 yards to 349) and had more first downs (23 to 15). Each team turned the ball over two times, although Washington was flagged seven times, to two penalties called on the Patriots. Jim Plunkett completed 17 of 33 passes for 255 yards and two touchdowns with none intercepted. Josh Ashton (pictured below) had a big day as he rushed for 108 yards on 23 carries and a TD and added another score on his lone pass reception. 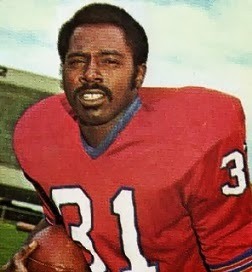 Bob Windsor caught 5 passes for 58 yards and Reggie Rucker gained 69 yards on his four receptions that included one for a TD. For the Redskins, Bill Kilmer was successful on 14 of 30 throws for 213 yards and three TDs along with one interception. Charley Taylor caught 7 passes for 134 yards and two touchdowns. Larry Brown rushed for 113 yards on 20 attempts. The two closely-fought wins didn’t prove to be signs of better days coming for the Patriots. They lost their next nine games in a row and finished up at the bottom of the AFC East. Coach Mazur didn’t make it to the end, resigning under pressure, and ex-Packers mentor Phil Bengtson coached the last five games. Washington, by contrast, recovered to win nine straight and topped the NFC East at 11-3. They went on to win the conference title before losing the Super Bowl to undefeated Miami. Jim Plunkett had a rough second year, completing 47.6 percent of his passes for 2196 yards and just 8 touchdowns while placing second in the NFL with 25 interceptions and being sacked 39 times. Josh Ashton, on the other hand, had signed with the team as a rookie free agent and ended up leading the club in rushing with 546 yards.